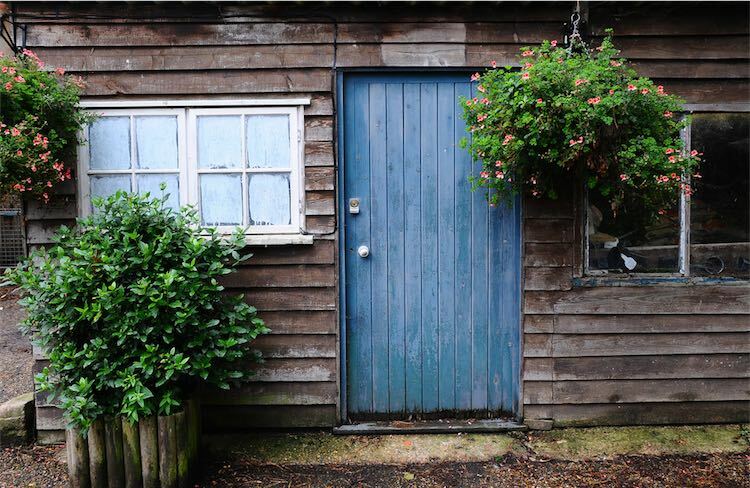 During our research, we discovered that there are many things to consider when looking for a garden shed. The first thing one needs to think about is how much space is needed to adequately store everything and still be easily accessible. When looking for your perfect shed, you need to think about the things you will be putting in and how you would like it organized. Amongst that, it is important to have a nice well-drained, high but level spot adjacent to your vegetable garden or where-ever you see fit. Another consideration is to make sure whether or not a permit was required. You can inquire through your city, sometimes there are regulations on sizes and height. So before anything, those steps are something you should consider before purchasing or building. Gardening is one of the greatest hobbies because it gets you out into nature and gives you a real sense of pride and accomplishment and you can really see how your work pays off in such beautiful and delicate ways. 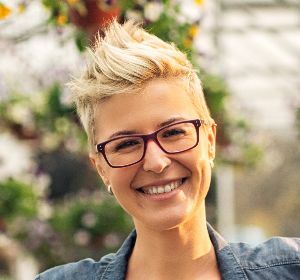 However, as all gardeners know, it can be easy to accumulate a lot of tools and equipment as the years go by so picking out the perfect shed for your backyard is important if that is the route you are going. There are several different kinds and different themes you can work with based on your budget. Below we have the top 10 best ones that your money can buy! Are you looking for a lot of storage space that won’t take a lot of room? Well, it’s possible with the Rubbermaid Big Max Junior Storage Shed. This is our top-notch choice since it is very easy to assemble. It has a double-walled durable construction in order to protect the items stored inside the shed. It is made of all-weather resin so you won’t have to worry about rust or rot and other issues. It features the latest wall anchor system for easy installation on your shelves, pegboard and other accessories. Includes a heavy duty and impact resistant floor. The doors are lockable to further secure your precious belongings. It is attractive and durable (weather-resistant, dent-resistant, leak-resistant). No need for maintenance. It has double doors to provide a wide entry. Lifetime 6402 Outdoor Storage Shed is our second pick for garden sheds based on its appearance, size, durability, price and other features. 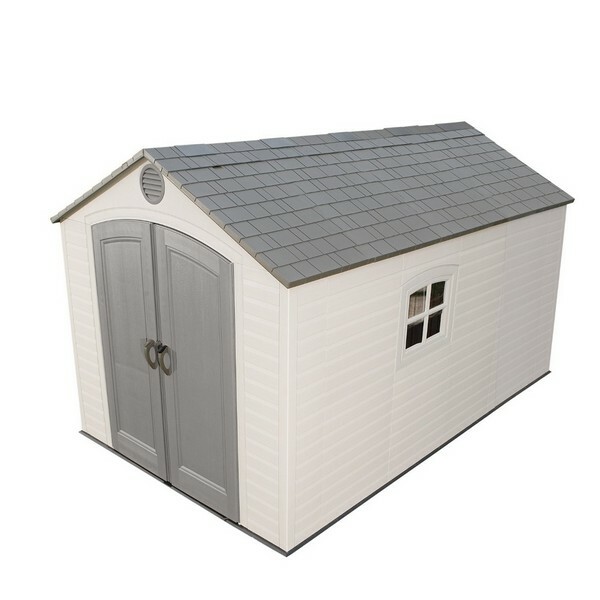 Lifetime offers various sizes and styles of sheds. However, we discover that the 8 x 12.5 size is the most convenient without the need for an expansion later on. Since it has a 620 cubic feet space inside then you can easily store your 4-wheeler mower with an abundant space for other accessories. It even has more walking spaces so that you can easily access your belongings. Based on the manual, this shed should be built on a raised platform so that it can level with the ground. The strongest shed with double walling made from high-density polyethylene. Includes a slip-resistant floor which does not stain, chip, or scratch. This shed has a very attractive appearance. It will never fade nor rust since it is being painted with light creamed-color powder coat. It comes with a complete kit of accessories. More spaces which mean great value for your money. More durable compared to vinyl sheds. Should be constructed on a ground level. Overall, if you’re looking for an attractive and durable garden shed which includes full accessories and warranty then we highly recommend Lifetime storage sheds. With Lifetime sheds, you can guarantee that their products are made from high-quality materials with aesthetic appeal and excellent function. This is the reason why we choose the Lifetime 6402 8×12.5 garden shed as our number two choice. Rubbermaid is well-known for its easy installation, durability, and strong construction. This large outdoor shed is our third pick since it is perfect for a house with a big backyard. You can store a lot of tools too. It has wide double doors which allow easy access when storing mowers, wheelbarrows, and other huge tools. Indoor shelving is not included however it’s wall anchor system can permit you to easily install a customized shelf, pegboards, and hangers depending on your storage requirements. Wide double doors for storing bicycles, ladders, snow blowers, and large tools. Rubbermaid is best known for its durability and double wall construction. 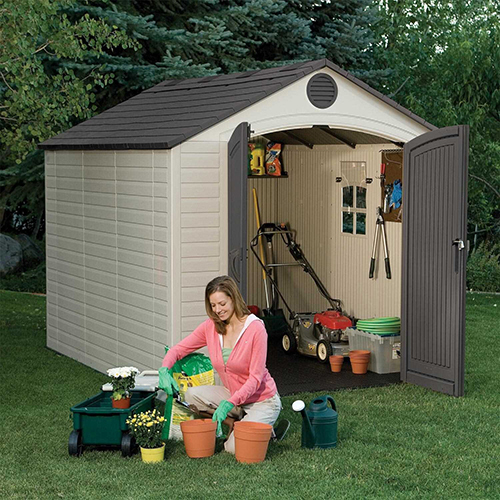 This shed is weather resistant, leak-resistant, and dent-resistant. No need for maintenance since it will not rust nor rot at all. Not so stylish since it is made from plastic. 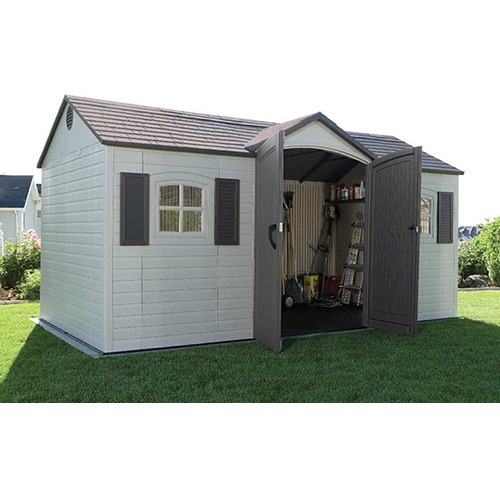 Lifetime 6405 Outdoor 8′ x 10′ Storage Shed is our fourth choice since it is made of high-quality materials with a huge storage for storing all your backyard equipment. It is maintenance free because it is rot resistant and weatherproof. This shed has a high roof with an inside dimension of 6’8″. Includes a slip-resistant flooring which does not peel, chip or crack since it is made of high-density polyethylene. It is likewise stain and oil proof. It has steel-reinforced doors with high arch for more strength. Provides natural lighting inside through its skylights, screened vents, and shatter-proof window. This shed can last longer and you won’t have to worry about any problems at all. Includes internal locking mechanism and indoor customizable shelving. This shed has high performance with durable construction. It comes with 4 big skylights, 2 screened vents and 1 shatter-proof window. It has a high door opening of 4’W X 6′ H.
The steep roof permits fast drainage for rain and snow. The price is quite costly. Additional shelving is also costly. 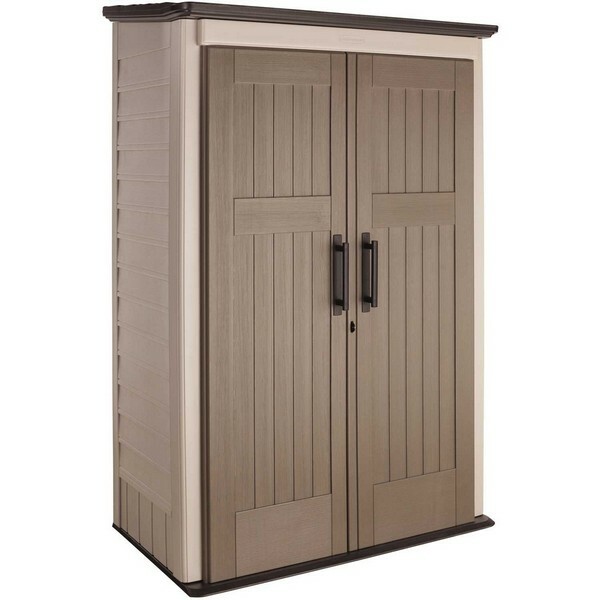 If you are looking for a high-end option with lots of storage then the Lifetime 6446 Garden Shed is the best choice which makes it our fifth option. It has a high A-Frame roof which provides a 6’8″ headroom. This shed is fabricated from high-density polyethylene along with steel wall supports. It comes with two shatterproof windows which can be opened for more ventilation. With this shed, you can enjoy a homey feeling making it the best addition to your backyard. It has more room spaces. Made of weather-proof plastic that is resistant to rot and rust. Includes 6 skylights, 2 shatterproof windows, 2 vents, 2 shutters, 2 peg strips, 2 90″ x 9″ shelves and 4 corner shelves for more ventilation. It has a dual wall UV-protected construction. This shed has a low maintenance. It comes with heavy-duty steel trusses to provide more roof strength. This product is covered by a 10-year limited manufacturer warranty. It has an attractive appearance and design. The high pitched roof permits fast drainage for rain and snow. It may not be as attractive as wood. This shed needs some assembly. Needs a big and sturdy level ground for installation. We choose Arrow Woodlake for our sixth option due to its attractive appeal and inexpensive price. It is a midsize garden shed that is fabricated from pre-cut and pre-drilled metal. It has easy to open doors which are lockable outside. 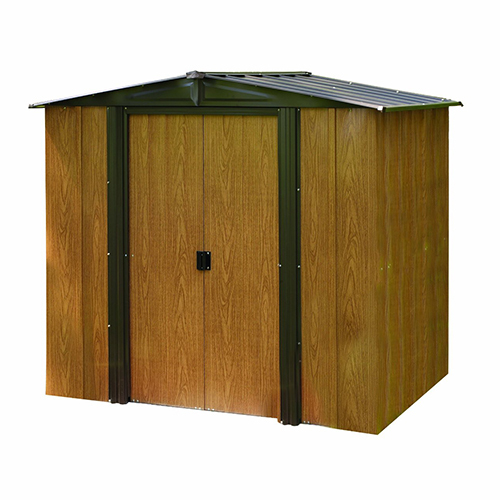 This shed has a wood grain and forest green exterior which makes it ideal for any woodland backyard. With Woodlake, you can enjoy having a convenient storage space where you want it. 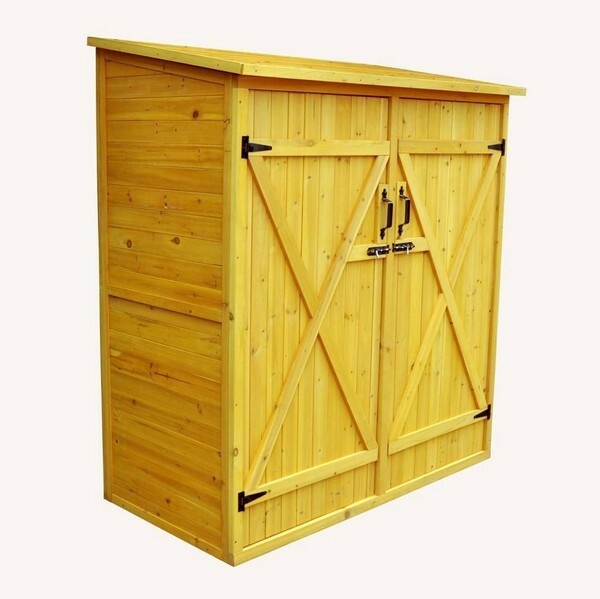 It is a great value shed for your garden tools, furniture, and sports equipment. This shed has an attractive wood grain panels. Easy assembly because it is made of pre-cut and pre-drilled materials. It is durable and can last longer because it has galvanized steel parts. This product is covered by a 12-year limited warranty. It has double-braced for more strength. The track doors glides are smooth and non-sticky. 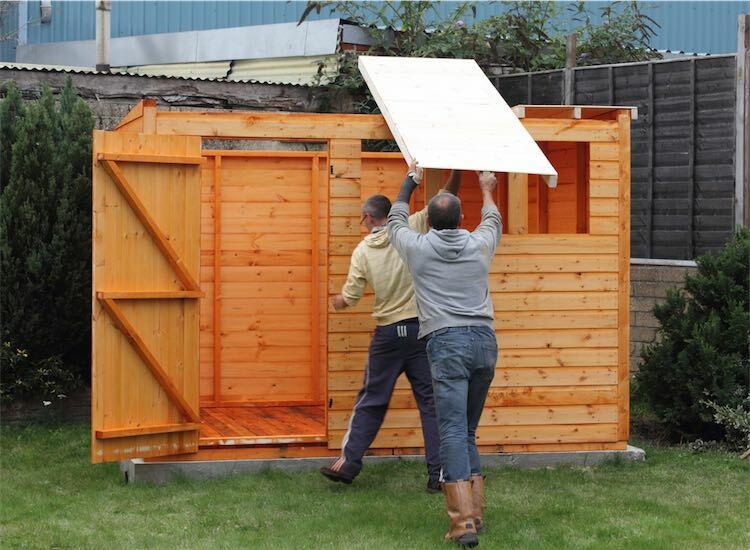 This is an inexpensive shed which fits on your budget. Does not include internal storage or shelves. Metal construction has a tendency to bend easily. Needs an entire pad for the flooring. 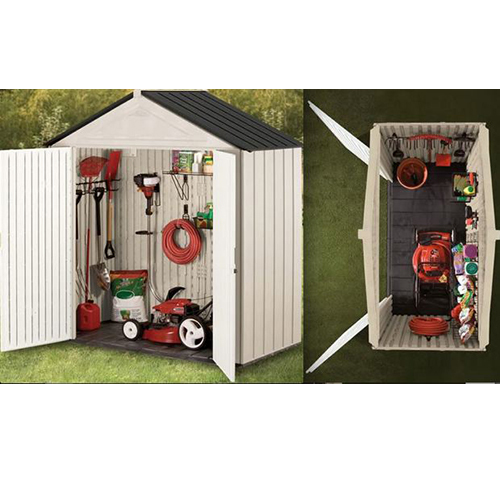 Lifetime 60057 Outdoor Storage Shed is our seventh pick. It has the best size for storing your mowers, wheelbarrow, and other garden equipment. You can hang hooks on its tough walls for storing long-handled garden equipment, hedge trimmers, as well as leaf blowers. 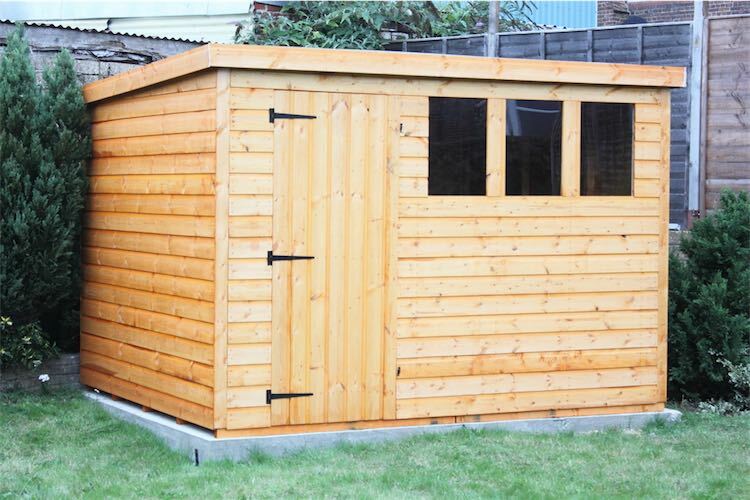 Despite the fact that this is not the cheapest garden shed, we admire its quality. It has thick walls with reinforced steel for more strength. It comes with a skylight for natural lighting and preventing opportunists from peeping in. According to its users, it is very similar to the picture which makes it a good shed. Its construction is made of high-density Polyethylene. 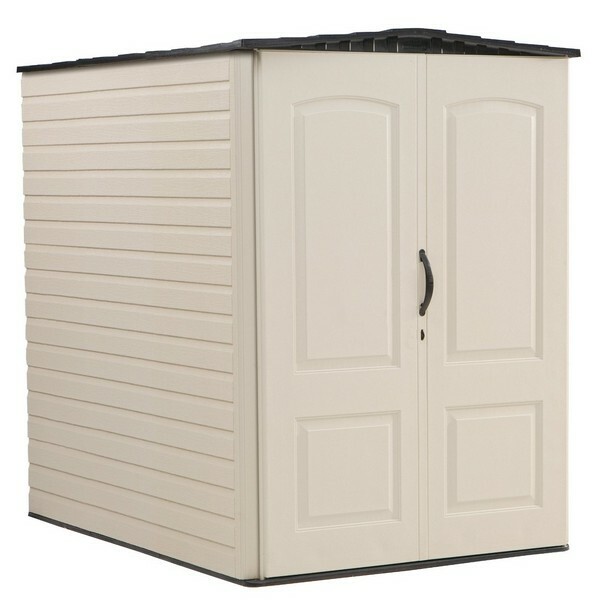 This is an excellent plastic garden shed which is perfect on the back of your garage or porch. It only requires low or no maintenance at all. 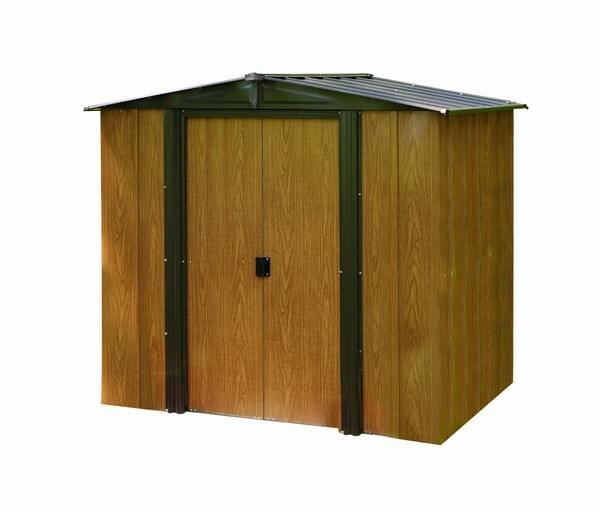 This heavy-duty shed is UV-Protected so as to avoid weather damage. It is covered by a 10-year limited manufacturer warranty. Its roof is made of heavy-duty steel trusses for extra strength. Includes 1 skylight, flooring, 2 screened vents, 1 30″ x 10″ shelf, 2 corner shelves and all the hardware required for installation. It comes with a latch and padlock loop. Needs a flat level base. You won’t be able to paint it. We choose the Leisure Season Medium Storage Shed for our eighth pick since most users love it because it’s very spacious. This solid wood storage includes indoor shelving. It has a good size which is best for storing longer equipment including shovels, rakes, and hoes. However, for smaller things, you can store it in the two huge interior shelves. This shed has a tongue and groove construction. It is painted with a medium stained brown color. A moisture resistant coating is applied to the wood so as to avoid getting rotten and keep it weatherproof. It has a medium size which is perfect for people who do not need a storage for heavy equipment, for instance, lawn mowers. All your tools and garden equipment can be stored in one place in order to keep your yard neat and clean. It has an appealing wooden design. The tongue and groove construction is very strong and durable. It is not secured since it does not have a lock. You won’t be able to store huge equipment such as lawn mowers. This Rubbermaid Plastic Large Vertical Outdoor Storage Shed is our ninth choice. It is the perfect storage for smaller garden equipment, long-handled tools, and other supplies and accessories. 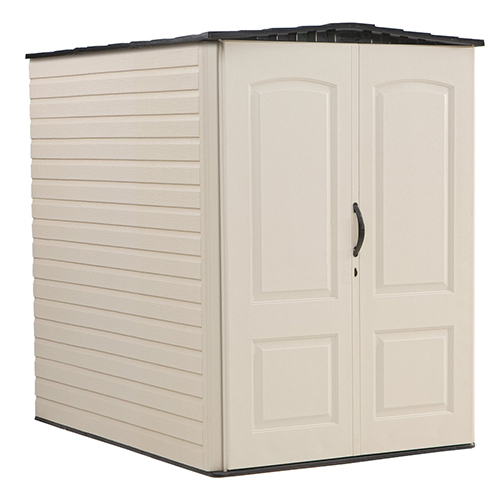 This shed is made from double walled heavy duty plastic which is resistant to dents, leaks, and weather. In contrast to sheds made of wood or metal, this plastic shed will never obtain rot or rust. It is very easy to assemble, in fact, there’s no need of having power tools. It does not have any indoor shelving, however, you can buy Rubbermaid wall anchors for installing shelves, hooks, and other storage accessories. It has an impact-resistant flooring to protect your items. It will never rot or rust, unlike metal or wood sheds. 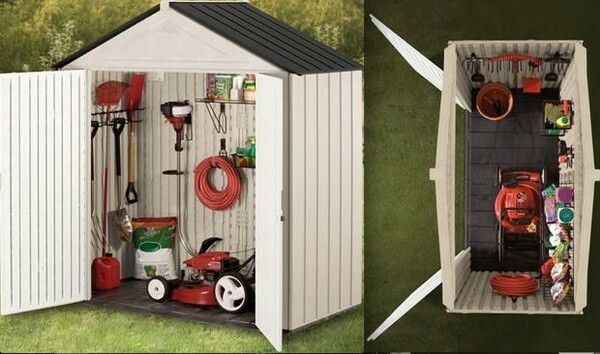 This shed can be assembled by two persons only using common household tools. There are a lot of spaces for your lawn and garden tools such as trimmers. You can easily organize your things by having customizable wood shelving (sold separately). It is covered by a one-year manufacturer’s warranty. It does not look stylish compared to wooden sheds. It is not ideal for large equipment. 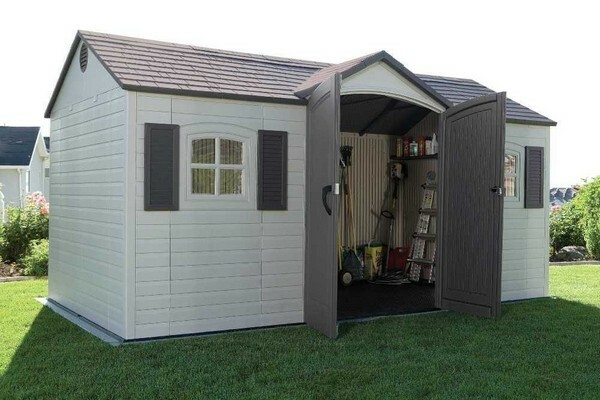 This 2×4 Basics Shed kit is our tenth choice. This is a Do-It-Yourself option which has a reasonable price. It is a durable kit which consists of 39 connector brackets which are 24 gauge galvanized steel. A list of the materials required is also included along with a lumber cutting list and instructions for assembly. 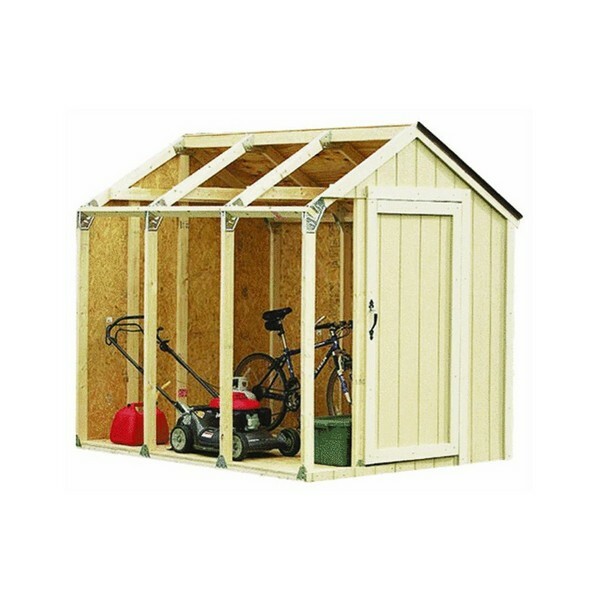 If you are planning to assemble a 7’x 8′ shed then one kit is already enough. For an 8’x 14′ shed, two kits are required while three kits are needed for a 10’x 22′ shed. The construction is very simple, in fact, it only needs straight and 90 degree cuts. There’s no need for a miter or complex measurements. Even if you are not a carpenter, you can easily assemble this shed kit. Let’s you choose your own size of a shed. It is very easy to assemble. This product is covered by a two-year warranty. It costs less. This shed is heavy duty and durable. You have to purchase a lot of things such as woods, paints, and others. Requires two persons to assemble. 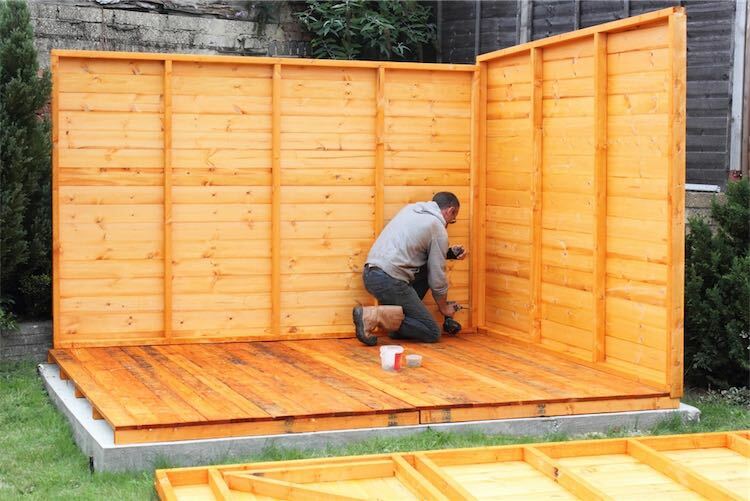 Before beginning the construction of your shed you will need to clear and level the area. If you are building a wood floor you will need to keep it away from the ground to prevent rot. You can either set the foundation on cinder blocks or set it on top of gravel (3-4 inches thick) you want to make sure you prevent moisture from the ground and the cinder blocks or gravel will help. The construction of a wood foundation is usually built using pressure-treated 2×6 lumbers. These parts are called the band on the ends and the joist in the middle of the band, spaced out 16-24 inches apart. The foundation frame will sit on top of pressure-treated 4×4 posts called skids. The skids will set on the cinder blocks or on top of the gravel to prevent rot. Once the frame has been squared and leveled you can install the floor deck and start nailing it all in. When the floor completed you can assemble the wall frame on the leveled floor. You can build the wall frames using 2×4 lumbers. The top and bottom 2×4’s are called plates. Place the 2×4 wall studs 16-24 inches apart and nail through the plates and into the wall studs. While the wall frame is still on the ground you can install the siding to make it easier. When the wall is completed rise it up and nail it into the floor. The roof truss can be built using 2×4 or 2×6 lumbers. There are different ways to build the truss, the most common is cutting out the rafters and assembling them using gussets. The easiest way to build the roof truss will be using plans. The other option will be to lay the 2×4’s or 2×6’s on the level floor set them how you want your roof and make a template. Once you are satisfied with your plan and the look of your template you can build the rest. If you will be adding a window you will need to cut out the wall and frame it for the size of the window. The siding will need to be installed following the manufactures instructions. The shed door can be built using exterior plywood. Install 1×4 trim around the door and to the door opening. Add hinges to the trim on the door opening and secure to the door. When the shed is complete you can make it look nicer by installing trim and painting it. Install 1×4 trim to the four corner walls and wherever the siding meets. Do not make the mistake of not building your own shed because you have never done it before. With the right shed plans, you will get the same results the experts get. Begin by choosing plans you are comfortable with and instructions which are easy to follow for you. Perhaps even study the building manual to get familiar with all the steps and to get to know the names of all the parts. When you are searching for plans to be aware of the building requirements for your area as mentioned above, make sure you if you need to get a permit, this is all done beforehand. We hope you enjoy this collection of favorite sheds—there’s every style from rustic and more traditional, to some more modern looking designs, including one with a living, succulent roof. If you are going to build your own shed, this should help determine which type you would like in your garden as well. Whether they are used to store yard tools or provide a quiet spot to get away, there’s something so alluring about these little buildings. A garden is a place where people go to relieve their stress and to keep their sanity. Gardens also reflect emotion.